What are the Small Business Owner’s Top Challenges Based on the Number of Employees in the Business? 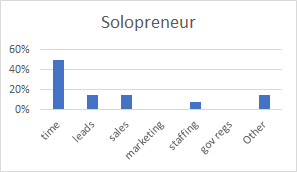 The graphs below represent the results of my Business Owner Top Challenge Survey conducted in March 2017. The purpose of the survey is to understand the different challenges of business owners based on the size of their business. Size in this case is established by the number of employees in the business. If we start from smallest to largest businesses in the survey, we see some interesting shifts in challenge priorities. For the smallest business – the solopreneurs, their dominate challenge is time. This makes sense because when owners don’t have support from employees, they wear all the hats in the business. Usually scrambling, there’s not enough hours in the day. To overcome they must learn how to organize and prioritize their daily tasks. Once they do, they can begin moving to the next level with a clear focus on increasing sales. As we move to the next level (1-3 employees) we see time is still one of the main challenges. But the business has grown to the level of having employees, and the owner must now sustain the business. Growing leads and sales, and well as managing the staff all become prominent and equal challenges. The business priorities become operations process improvement, and sales/profit optimization. 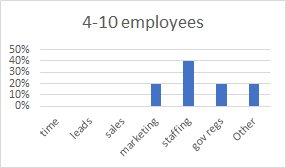 Finally, by the time the business grows to 10+ employees, the business owner’s largest challenge is finding, hiring and retaining quality employees. The owner has been adding more staff. The additional staff are assuming more of the responsibility for operations, sales and marketing duties. This frees the business owner from these duties, and their primary challenge becomes ensuring there is sufficient quality staff. 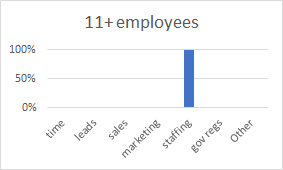 I was curious about what part of staffing was the biggest challenge for the owners. 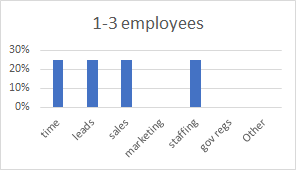 I re-surveyed the owners of the 4+ employees categories. They unanimously answered their main staffing challenge is locating and attracting new employees for their business (over the actual on-boarding and retaining employees). These business owners need clear and effective staffing strategies in the current tight employment market. If you have any questions, feel free to drop me a line.